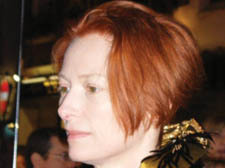 WHAT’S all this fuss in the tabloids over the open relationships of the actress Tilda Swinton? The fact that she is part of a foursome sharing the same house with her children, she with a younger lover, while her long-term partner is involved with a woman 16 years younger than him, well, all I can ask myself is: So, what’s new? Perhaps I wouldn’t have felt so smug reading the papers on Monday if I hadn’t sat on the only chair available at the London Review bookshop in Bloomsbury, entranced by a PowerPoint talk given by the famous scientist, author and thinker, Carl Djerassi. Now in his mid-80s, Djerassi’s mittel-European accent, slightly disguised by a thin layer of Americanese, floated across the store, packed with an audience of nearly 100 devotees. What did all that have to do with open relationships? Djerassi’s talk had been billed as an exploration of the Jewish identity, publicising his latest book, Four Jews on Parnassus (Columbia University Press, £17.50). But, in fact, it really explored the lives of four great Jewish intellectuals – Walter Benjamin, Theodor Adorno, Gershom Scholem and the composer Arnold Schonberg, who dominated intellectual life in Germany in the first half of the last century. And this is where open relationships came into his talk. It turned out that both Walter Benjamin, who tragically died escaping from the Nazis, and his wife Dora, lived through an “open” marriage with other lovers, as did Adorno and his wife Gretel. Adorno, a tireless womaniser, kept no secrets from his wife. Once, under his dictation, his wife typed a passionate love letter to his latest flame because the “other woman” couldn’t read his terrible handwriting! I suppose it’s possible to get more open than that but I can’t imagine how. A frightening polymath, Djerassi, a Jewish refugee from Vienna in the 1930s, is one of America’s most eminent chemists – he created the first contraceptive pill – as well as becoming a successful novelist and playwright. STAND by for a lively debate at a conference this weekend, organised by the Freud Museum in Maresfield Gardens, Hampstead. Called Psychoanalysis, Fascism and Fundamentalism, it brings together leading psychoanalysts, historians, social theorists, writers and film-makers to chew the fat at University College London over what prompts fundamentalist intolerance. Among the line-up of academic big-hitters are Queen Mary University professor Jacqueline Rose and the journalist Mohsin Hamid, whose 2007 book The Reluctant Fundamentalist was shortlisted for the Man Booker prize. Another name that stands out is the film-maker David Modell, whose work includes the excellent and shocking Channel 4 documentary In God’s Name, which revealed the depths of religious fundamentalism in Britain today. WHEN jazz trumpeter Humphrey Lyttleton passed away earlier this year, his band decided to honour a booking he had made for the Friends of the Royal Free Hospital. You will recall he had played at the Hampstead hospital once a year for a decade and raised thousands of pounds by doing so. To say a posthumous thank you, Friends member Eva Ratz pledged the proceeds of an art show she curated in her Hampstead home on Saturday to the Humphrey Lyttleton Music Trust. Mrs Ratz, whose own wooden sculptures are particularly striking, uses her annual show to raise money for charities of her choice. The event included glass, prints, paintings and installations, jewellery and sculpture, and was opened with music from the Trumpeters Band, which includes clarinetist Wally Fawkes and Jimmy Hastings. Last year they raised around £2,000 and hope to reach a similar sum this time round. Artists receive a cut of the sales, while the rest goes towards the chosen charity. ALWAYS immaculately turned out, the actress and author Janet Suzman was busy brushing dust off her coat on Tuesday night as she spoke at the Heath Library in Hampstead. She revealed she had had to put up with months of building work as her neighbours constructed something akin to a “shipping container”. “It is why I am so dusty,” she joked. But despite the disruption, she told members of South End Green Assocation at their annual meeting that South End Green had been good to her over the years, helping to exorcise unhappy memories of the break-up of her first marriage. “When I left South Africa – the situation was untenable – I came to Hampstead, got married and the first place my husband and I found was a house in the Vale of Health,” she said. followed – until her marriage disintegrated. It meant she had to leave her Vale home. “There were so many memories there,” she revealed. “And it was a neighbourly place because of the way the houses are arranged. There are no front gardens or high fences – they are small enough for everyone to know everything. But it became for her the “Valley of the Shadow of Health”, and she could not stay there. Relief was at hand: a friend told her of a house for sale in South End Green. But her new road was not so good for her children to play in, a crucial aspect of childhood, she believes. “The only thing I miss is not having a house in a ‘play’ street – play streets are rare,” she said.